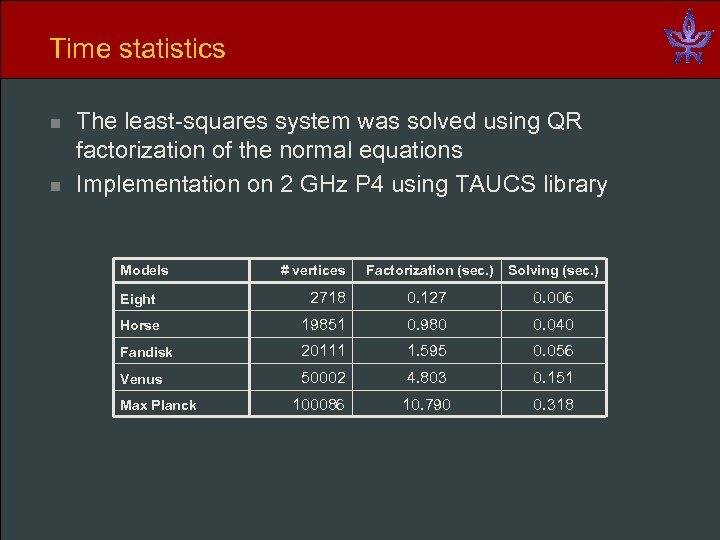 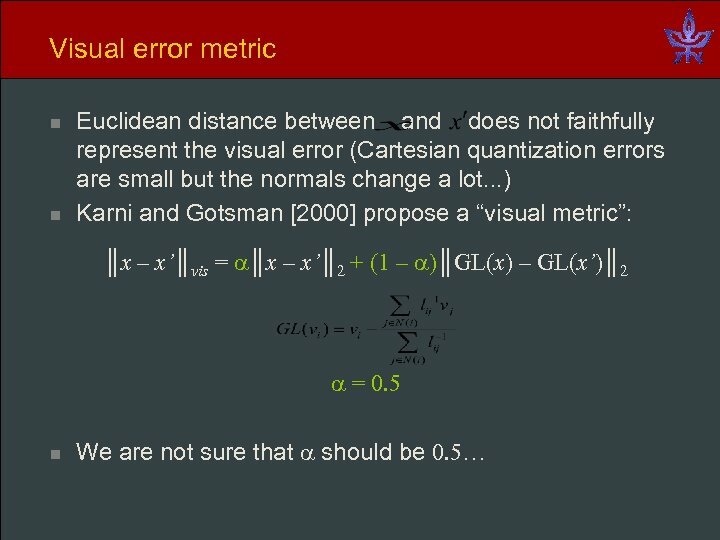 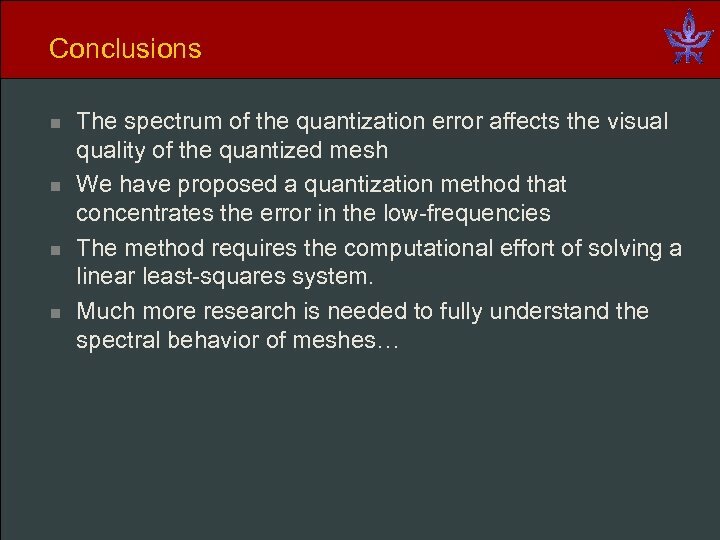 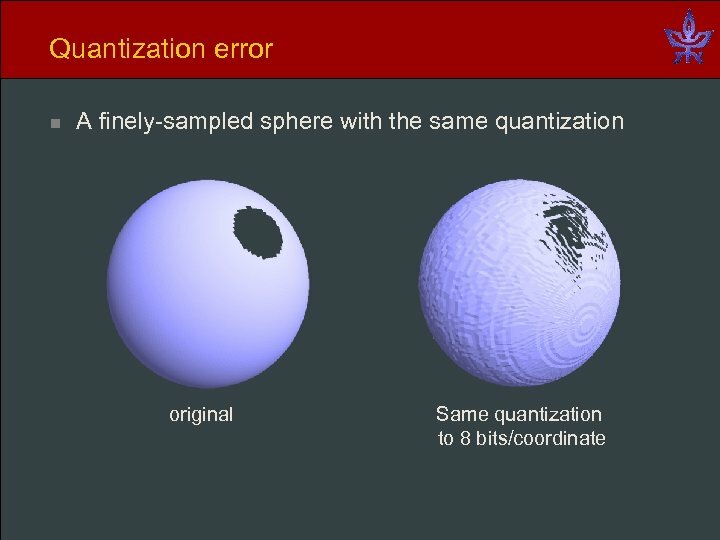 Quantization error n n Quantization necessarily introduces errors. 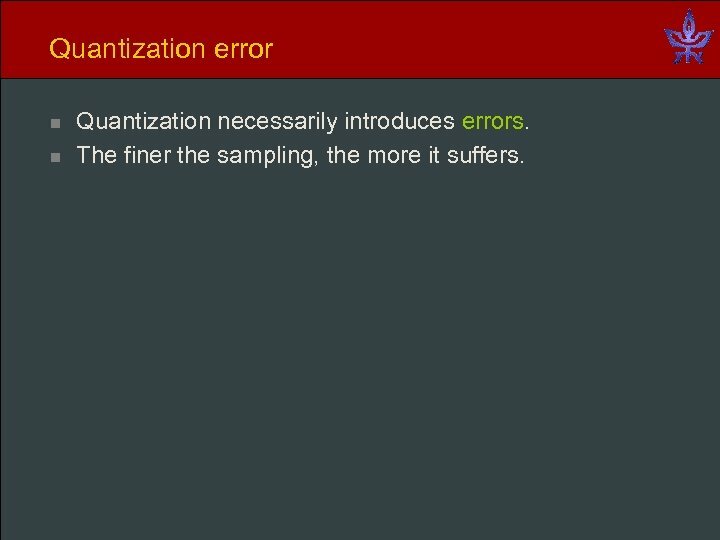 The finer the sampling, the more it suffers. 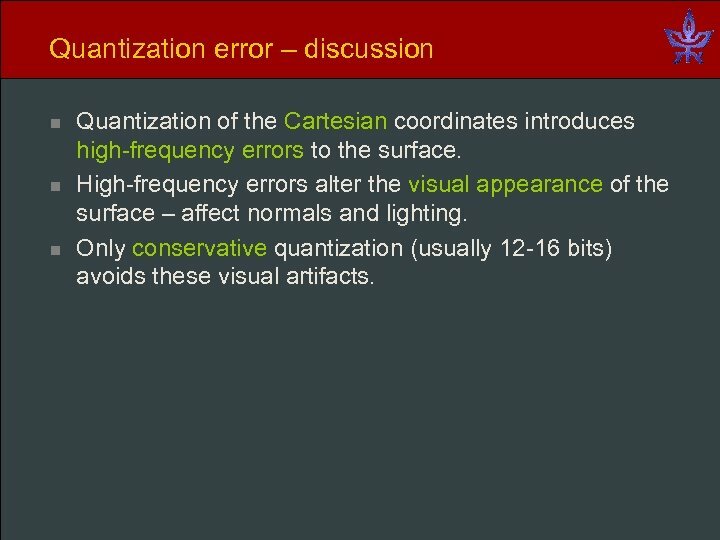 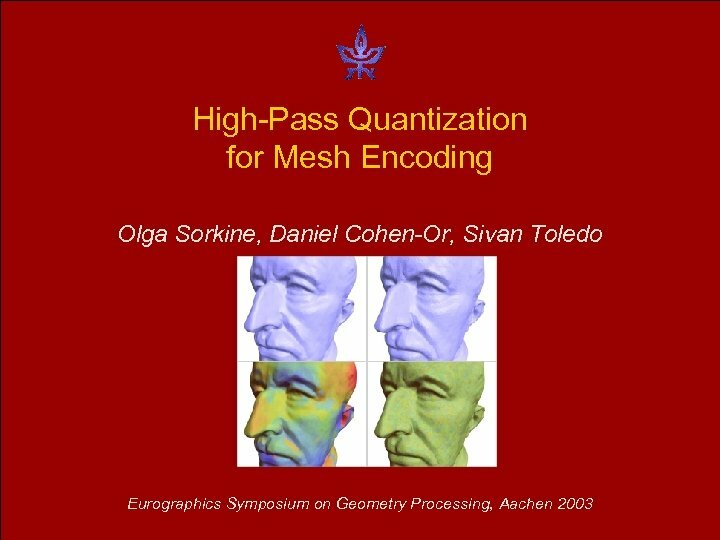 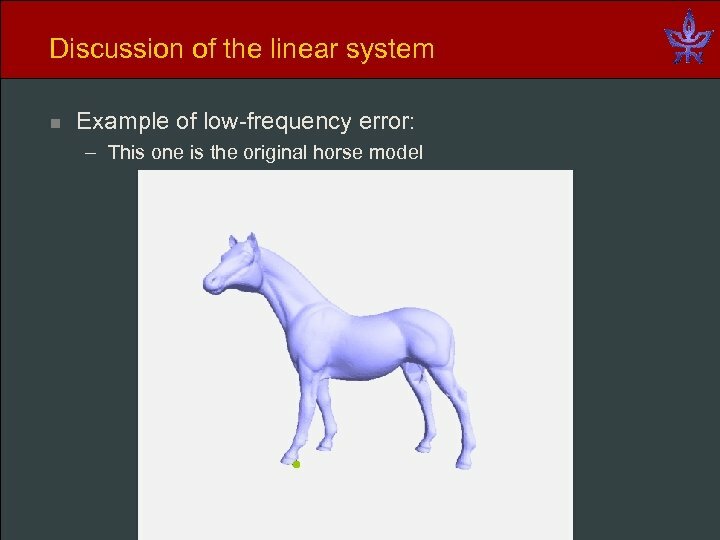 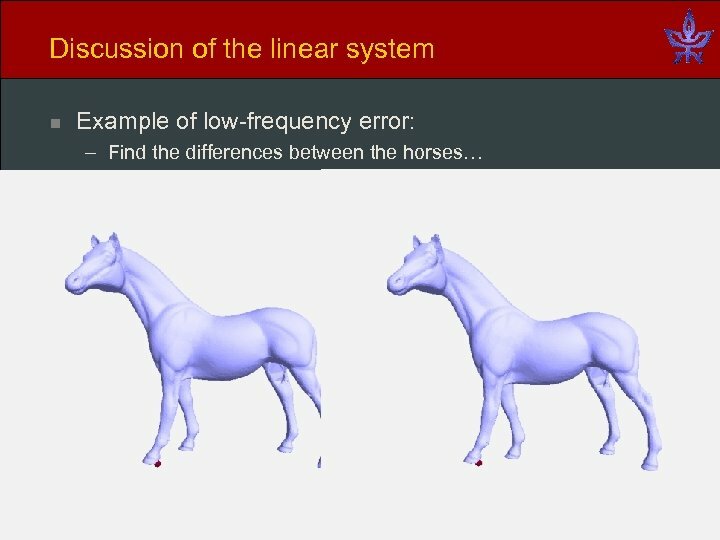 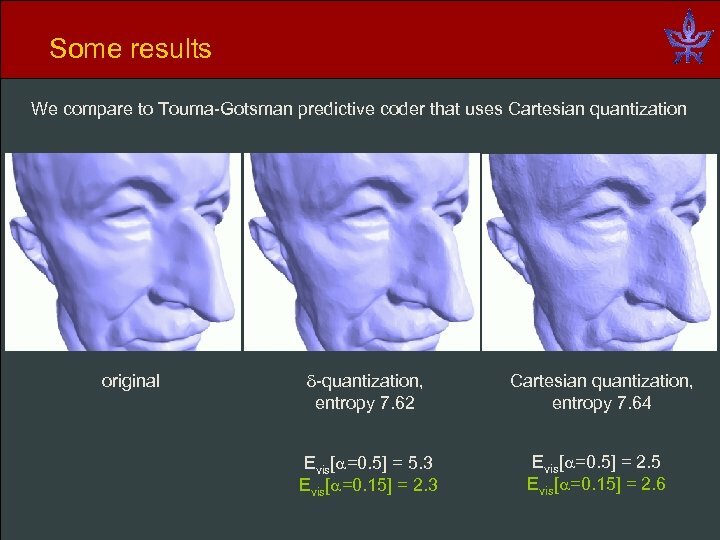 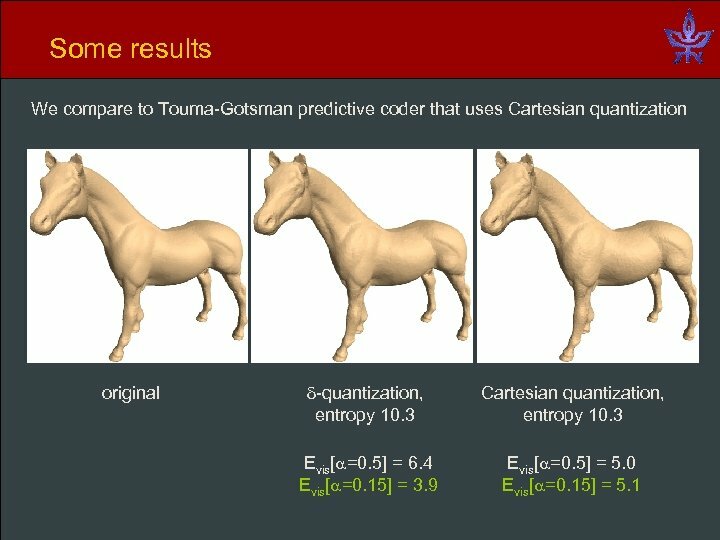 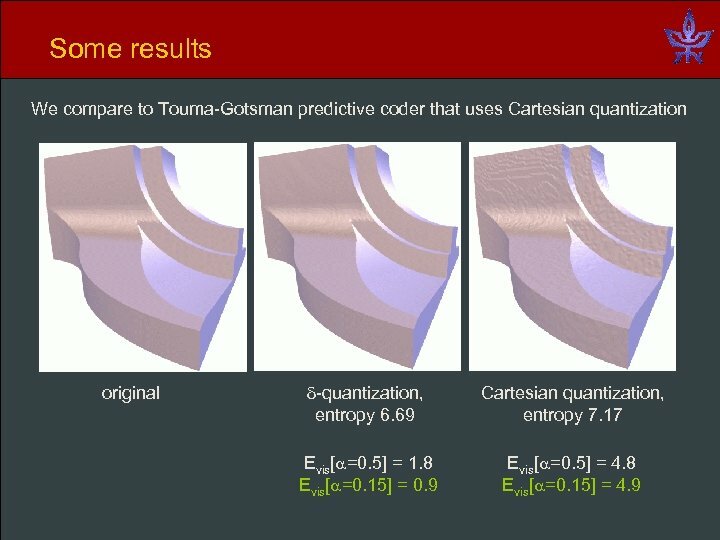 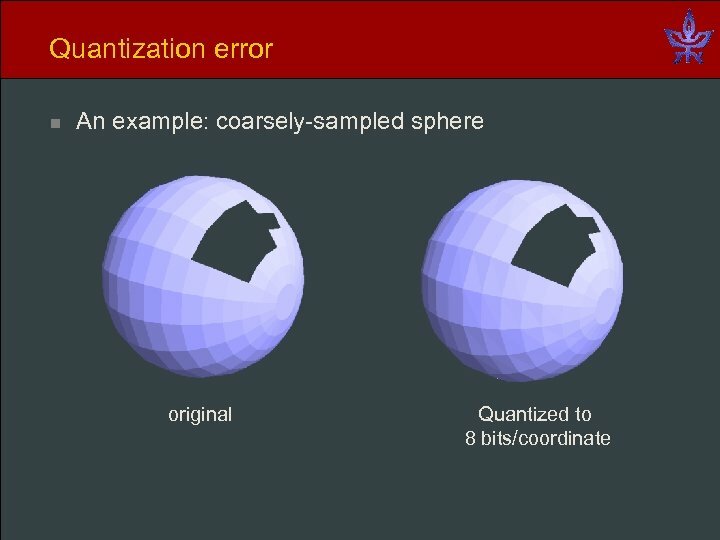 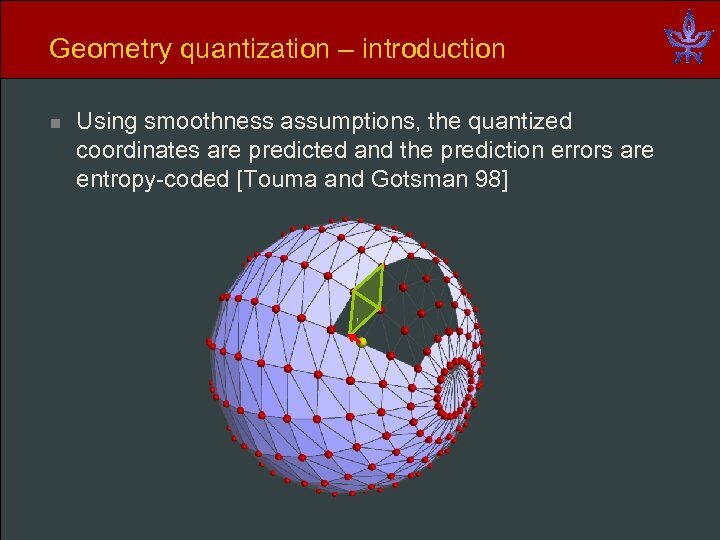 Quantization error – discussion n Quantization of the Cartesian coordinates introduces high-frequency errors to the surface. 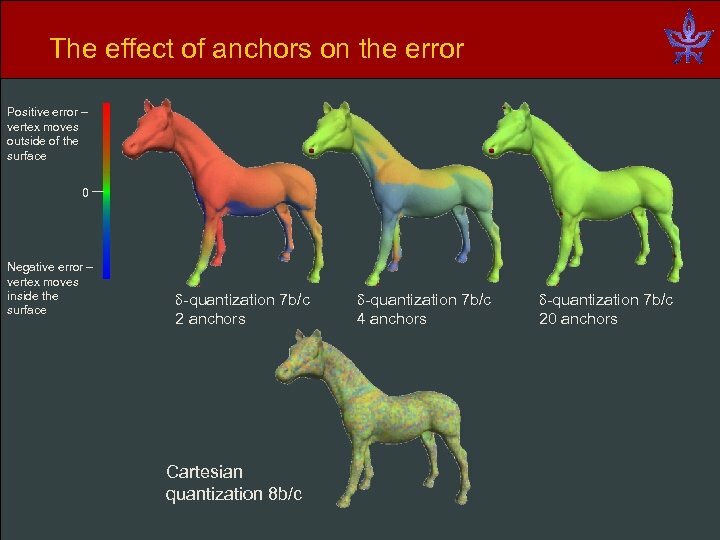 High-frequency errors alter the visual appearance of the surface – affect normals and lighting. 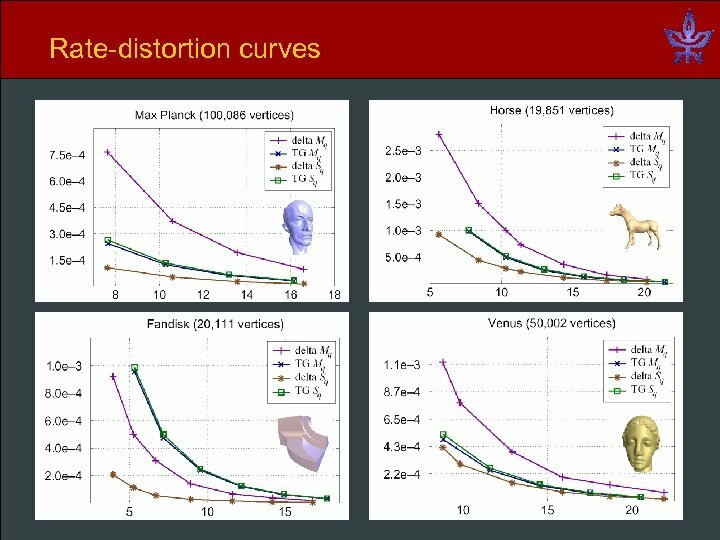 Only conservative quantization (usually 12 -16 bits) avoids these visual artifacts. 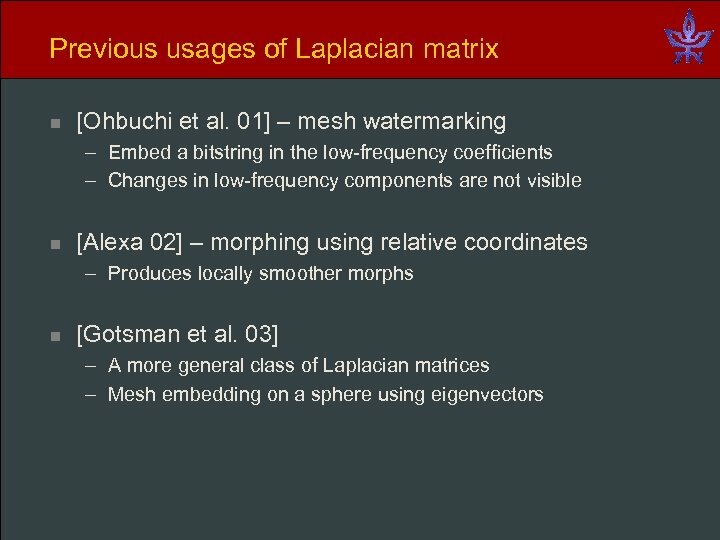 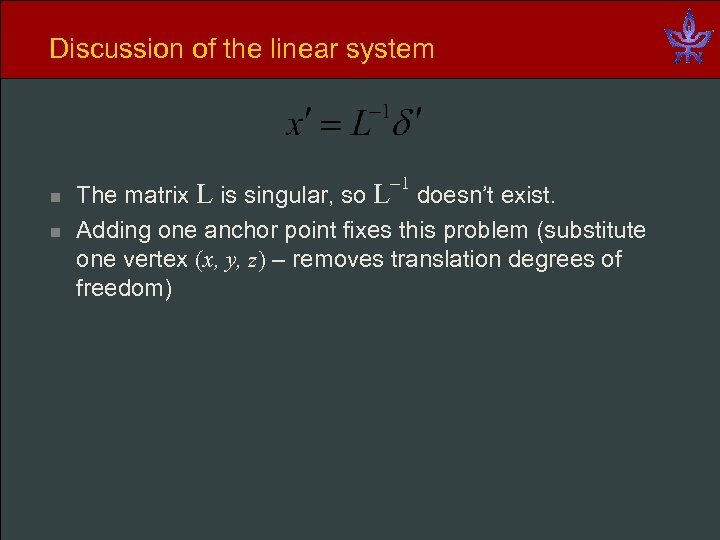 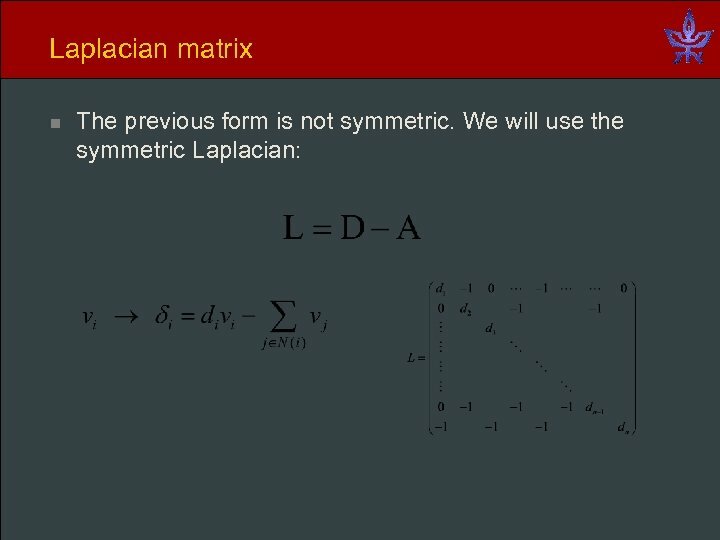 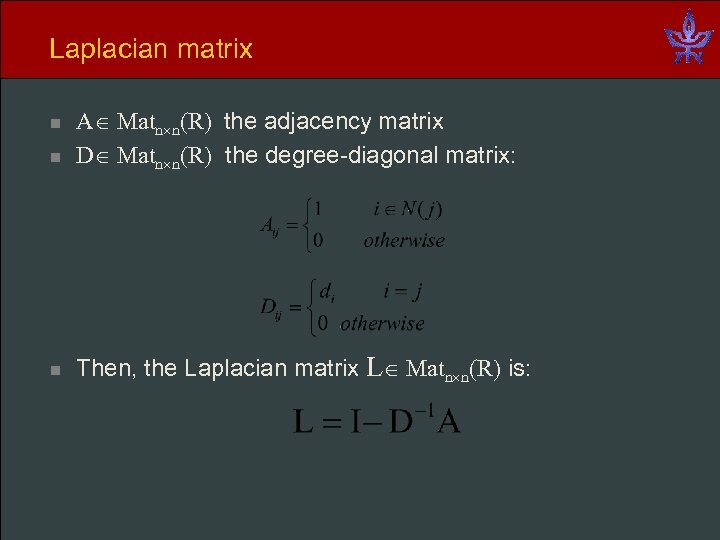 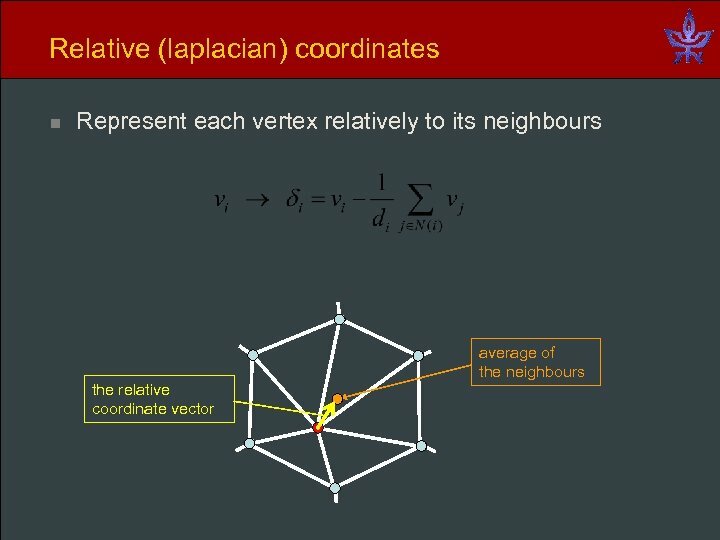 Quantization – our approach n n Transform the Cartesian coordinates to another space using the Laplacian matrix of the mesh. 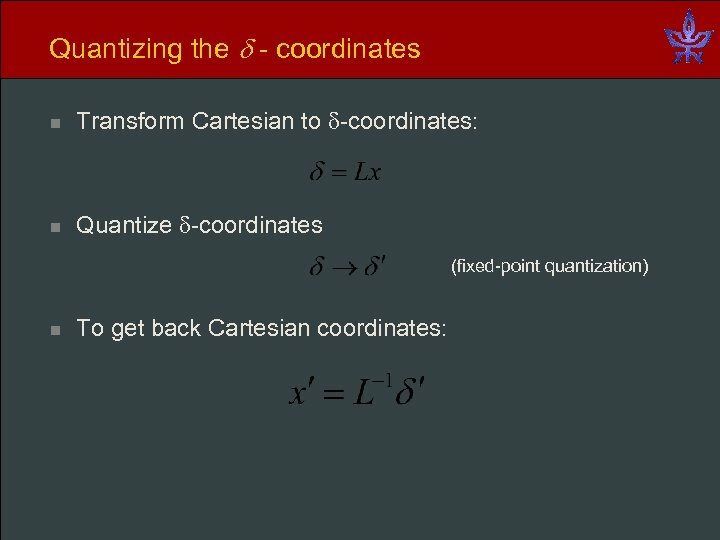 Quantize the transformed coordinates. 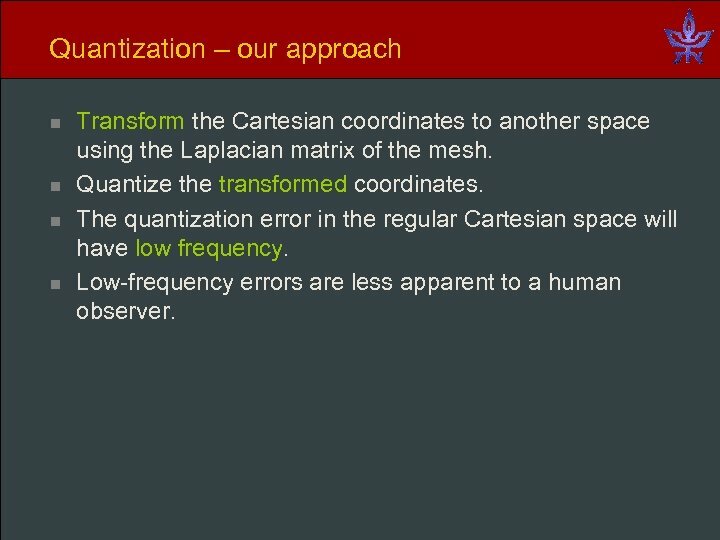 The quantization error in the regular Cartesian space will have low frequency. 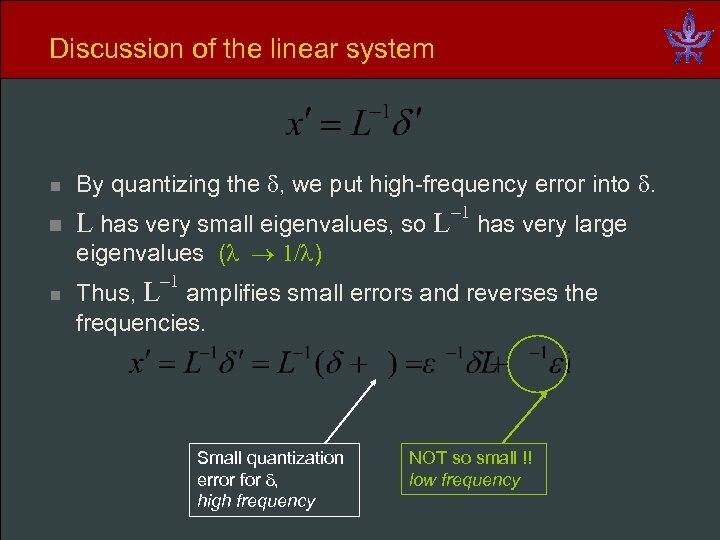 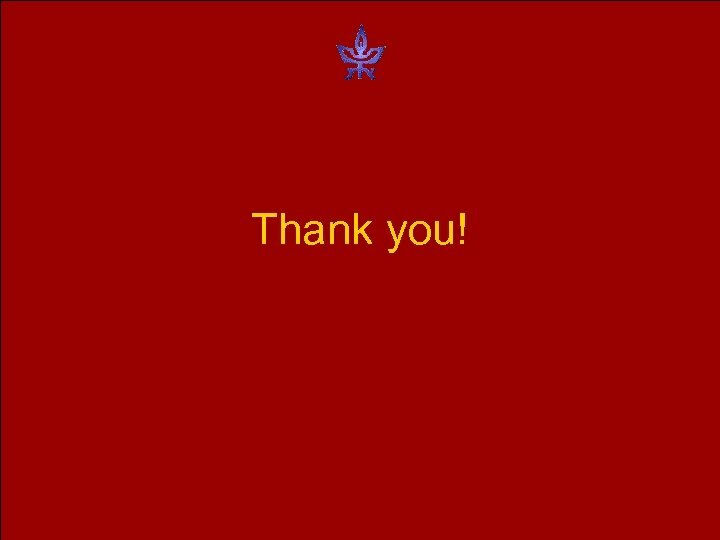 Low-frequency errors are less apparent to a human observer. 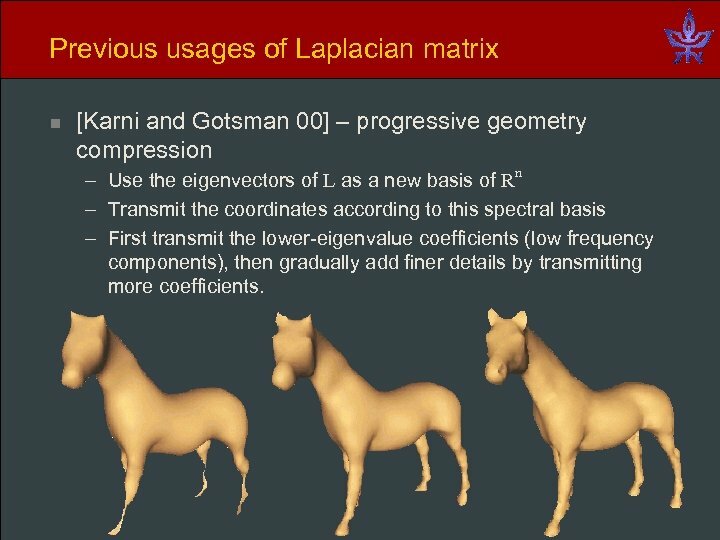 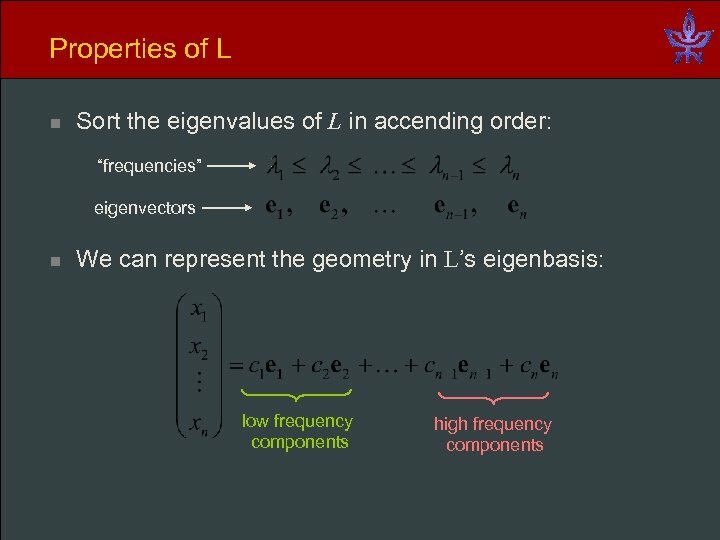 Previous usages of Laplacian matrix n [Karni and Gotsman 00] – progressive geometry compression – Use the eigenvectors of L as a new basis of Rn – Transmit the coordinates according to this spectral basis – First transmit the lower-eigenvalue coefficients (low frequency components), then gradually add finer details by transmitting more coefficients. 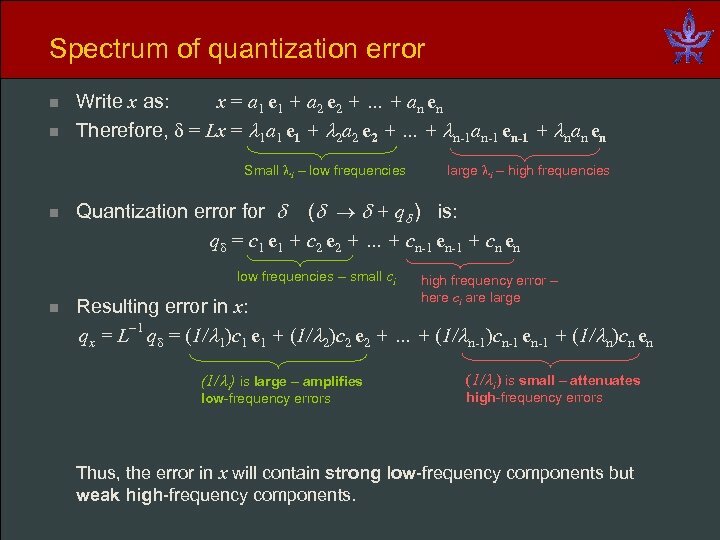 Spectrum of quantization error n n Write x as: x = a 1 e 1 + a 2 e 2 + … + an en Therefore, = Lx = 1 a 1 e 1 + 2 a 2 e 2 + … + n-1 an-1 en-1 + nan en Small i – low frequencies n Quantization error for ( + q ) is: q = c 1 e 1 + c 2 e 2 + … + cn-1 en-1 + cn en low frequencies – small ci n large i – high frequencies high frequency error – here ci are large Resulting error in x: qx = L 1 q = (1/ 1)c 1 e 1 + (1/ 2)c 2 e 2 + … + (1/ n-1)cn-1 en-1 + (1/ n)cn en (1/ i) is large – amplifies low-frequency errors (1/ i) is small – attenuates high-frequency errors Thus, the error in x will contain strong low-frequency components but weak high-frequency components. 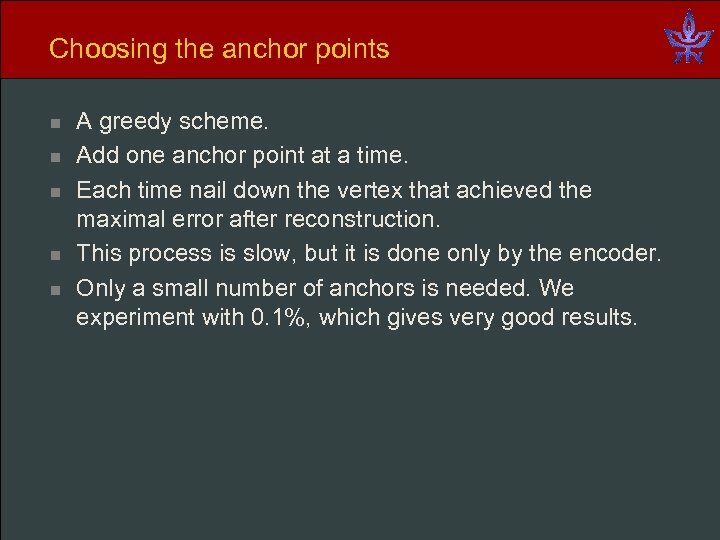 Choosing the anchor points n n n A greedy scheme. 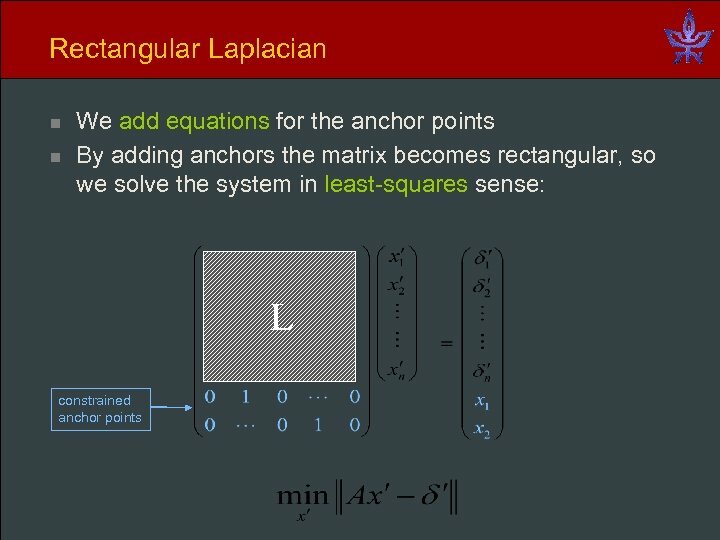 Add one anchor point at a time. 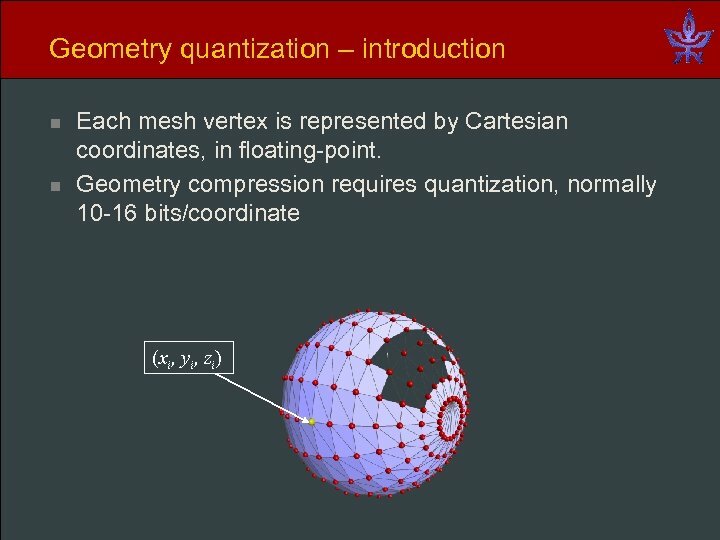 Each time nail down the vertex that achieved the maximal error after reconstruction. 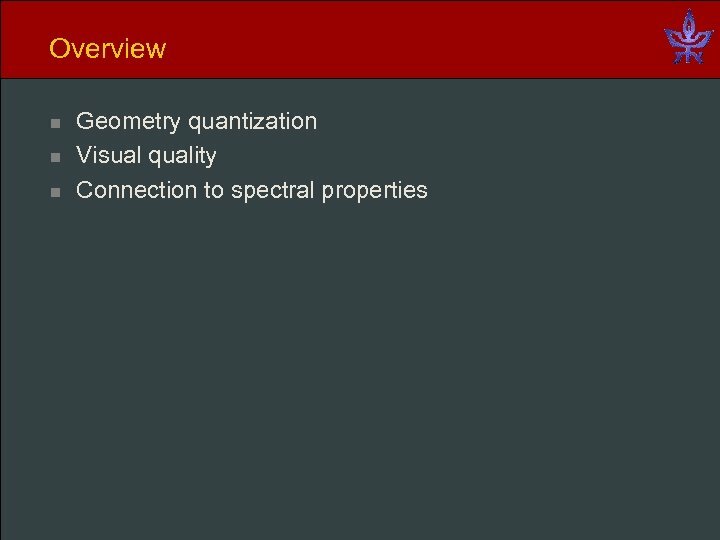 This process is slow, but it is done only by the encoder. 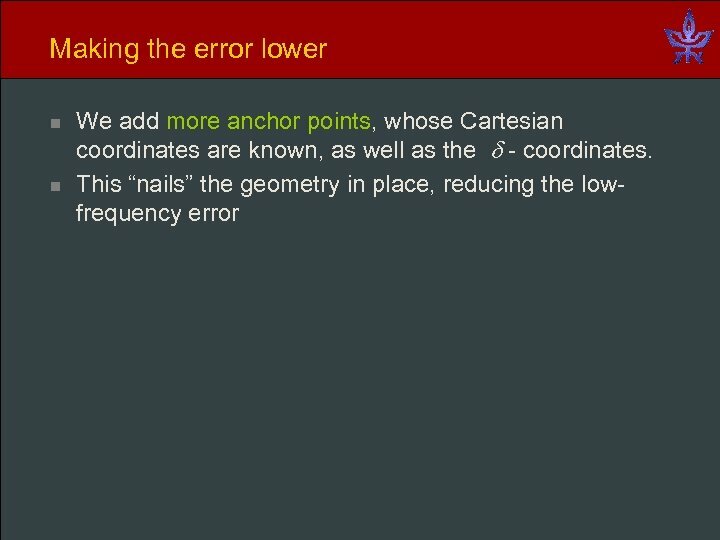 Only a small number of anchors is needed. 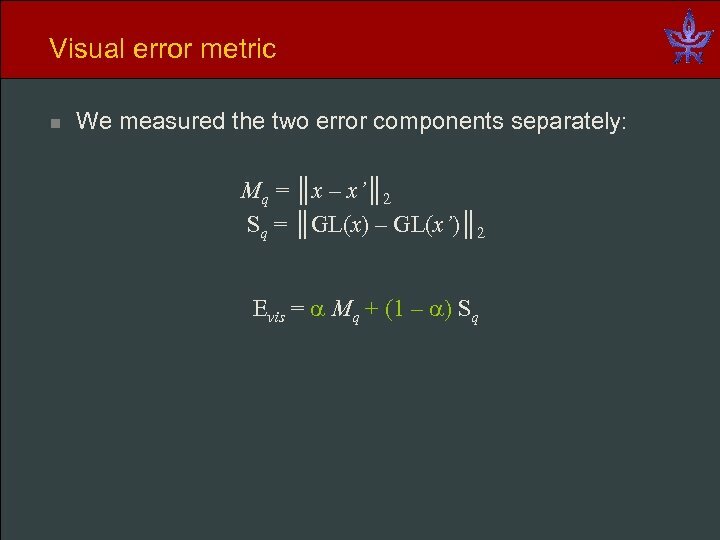 We experiment with 0. 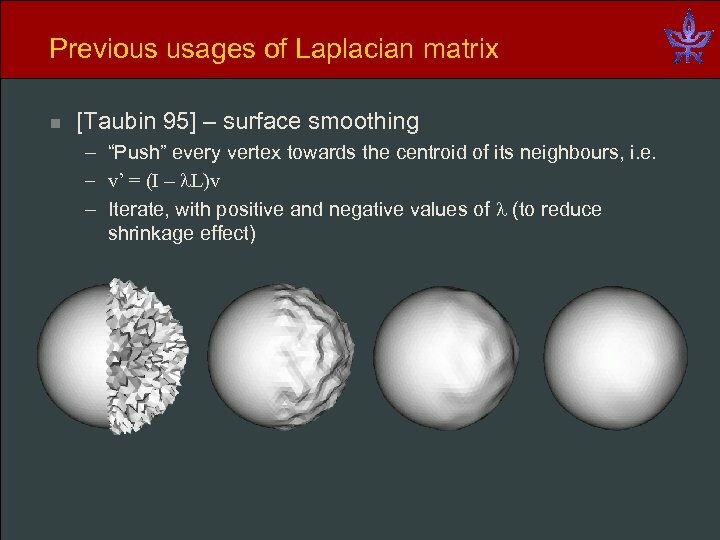 1%, which gives very good results. 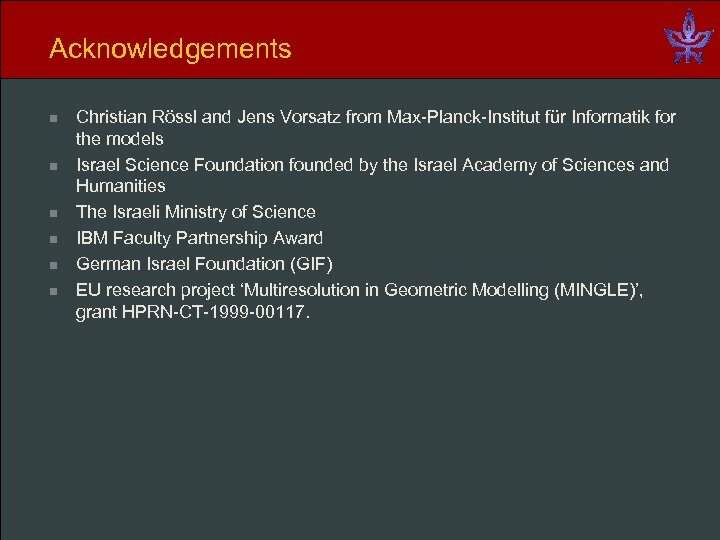 Acknowledgements n n n Christian Rössl and Jens Vorsatz from Max-Planck-Institut für Informatik for the models Israel Science Foundation founded by the Israel Academy of Sciences and Humanities The Israeli Ministry of Science IBM Faculty Partnership Award German Israel Foundation (GIF) EU research project ‘Multiresolution in Geometric Modelling (MINGLE)’, grant HPRN-CT-1999 -00117.